They say that a picture can tell a thousand words. Well, to be fair the photos that are on my Facebook page tell about a million. If I was to ever go into politics, these would be the images that would come back to haunt me. But what about turning a sketch into furniture? No honestly, the talented artist Jinil Park has done just that! 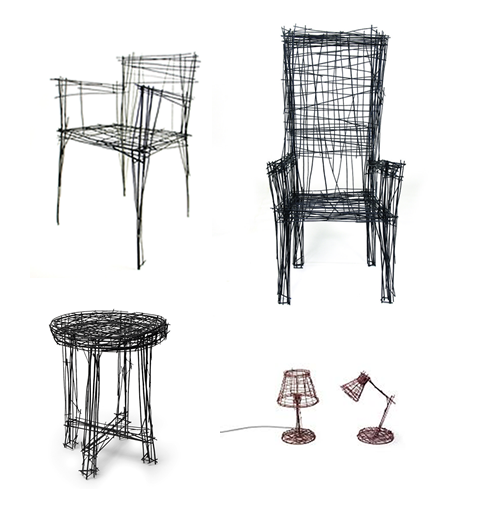 Using sketches of chairs, a table and lamps Park has used wires in different thicknesses to create furniture that look like the sketches… What a picture! The designs are based on actual sketches drawn by Park. The sketch designs are then built and welded together to create the furniture, basing the whole series on the drawings themselves. All designs are recreated based on how feasible they would be as structures. This design and structure process shows that Park is creating the range for practical use as well as structures which are pleasing to the eye. The distorted design emphasises the sketch effect and the design not being perfect makes the furniture more personal and relates to the artist herself. As the Line Drawing series is created by welding the different wires, the furniture is more durable and practical for use. Another enthusiast of the fantastic set has also pointed out that “the design also decreases the problem of staining fabrics when spilling your glass of wine…”. It seems that my friends have the right priorities, although I don’t think this issue would have been on top of Park’s list when sketching. I love how much feeling and emotion comes with such a simple design. Consider me a fan of the scribble furniture idea. Talk about ideas coming to life! Upon asking my Managing Director if we could have some in the lobby, the response was that they would scratch the granite floor… Details, details! I am guessing I might have to cross that idea off my list and draw a line under it, or a couple? I will just have to keep admiring it from my computer screen and remain enchanted by the style, whilst sitting in my office chair which doesn’t look like it has been drawn for me… Unfortunately!